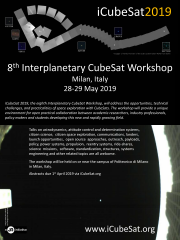 iCubeSat 2019 will be held over two days at Politecnico di Milano, Milan, Italy. Please note that the conference is an open conference and does not wish to discuss information restricted by ITAR or other export controls. U.S. citizens and permanent residents are responsible for ensuring that technical data presented is not restricted by ITAR and that ITAR controlled information is not discussed with non-U.S. citizens. Conference attendees are required to ensure that their presentations and discussions comply with the relevant export controls of their own country, Italy, and the European Union and those using the comments facility of the website are reminded that they should do the same. Jim Bell et al, ASU, U.S.A.
S. Pete Worden et al, Breakthrough Foundation, U.S.A.
MJ Rinehart et al, Drexel University, U.S.A.
Peter Klupar et al, Breakthrough Initiatives, U.S.A.
George Hawker et al, University of Cambridge, U.K.
Michael O’Neill, JHU APL, U.S.A.
Sachin Reddy et al, University College London, U.K.
Jason Corliss et al, University of Arizona, U.S.A.